Maybe it’s all those years spent under Communist rule that made Russians so creative. Maybe it’s because they’re used to making cars last for as long as possible. No matter what drives Russians to make weird car mods, there’s no one quite as creative when it comes to customizing automobiles. 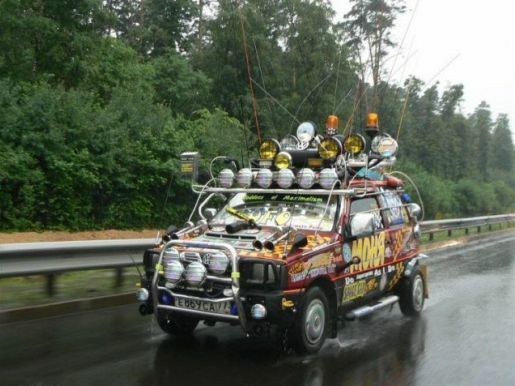 English Russia has a great gallery of weird and funny Russian car mods. Among my favorites are the lights and antenna model above, the car with cardboard fins and spoilers, and, of course, the home-made Rolls-Royce. If there’s one thing Russians must love (or maybe this is just something car modders in general love), it’s the spoiler. Every other car in the gallery seems to have a spoiler stuck on the front. The ones that don’t have a wind shear on the front to encourage aerodynamics (or to look cool). It wouldn’t surprise me if half the entries over at There, I Fixed It were Russian in origin!